Kia Motors has released a hearwarming holiday ad, inviting you to “show your love with a dream” and wishing you Merry Christmas. 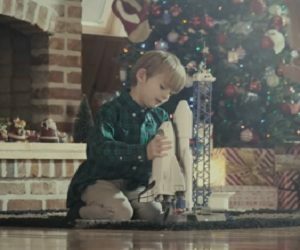 The spot features a little boy who dreams of exploring the outer space and his dad, who, after finding in the garage an old picture of him as a child and his father, does something unexpected. The photo, which is placed in a holiday card, with the message “Follow your dream. Love, Dad”, makes him understand his son’s passion from a new perspective and thus he decides to make some light arrangements near his Kia so that it would seem a spacecraft. Then, he goes to wake him up and the two go on board and explore together the Galaxy. The commercial ends with the onscreen lines “Show your love with a dream” and “Merry Christmas”.